The phenomenon of Cold Fusion came to the limelight in 1989 when Dr. Stanley Pons and Dr. Michael Fleischmann, two world-renowned scientists, announced they were able to create nuclear fusion at room temperature in their laboratory in the University of Utah. This announcement caused a major stir in the scientific community since it promised unlimited energy at minimal cost. As per conventional wisdom, two positively charged particles repel each other. Hence, in order to fuse two nuclei of Deuterium (an isotope of Hydrogen) and generate fusion energy, one would have to subject them to extremely high temperature and pressure to force them to come close and fuse together to create a new atom (of Helium). For example, the heat generated by the Sun is a result of nuclear fusion caused by the extremely high temperature inside the Solar core. Fusion at room temperature seemed like a pipe dream. The scientific community rolled up their sleeves and tried to reproduce the Pons-Fleischmann experiment in their labs. Unfortunately, most of them failed to reproduce the results. An inquiry committee was formed under the leadership of Dr. Huizenga. After a thorough investigation, the committee criticized the research for its unconventional approach and came to the conclusion that claims made by the Cold Fusion proponents were unfounded and it defied our understanding of nuclear physics. Some scientists debunked the research as pathological science, although few continued the work under different names and descriptions but with limited success. This story of Cold Fusion research intrigued me as I followed it off and on since 1989. The conflict between those in favor and those against has been chronicled in several books. The story had all the ingredients of good drama. So why not a play about Cold Fusion? And that’s how the play was born. What is the play Cold Fusion about? Many, who hear the title of my play Cold Fusion, think it must be about some esoteric scientific topic that only nuclear scientists could comprehend. Let me try to allay your fears. Yes, the play does talk about science since it takes place in a research institute and the characters are scientists, but it isn’t about science. 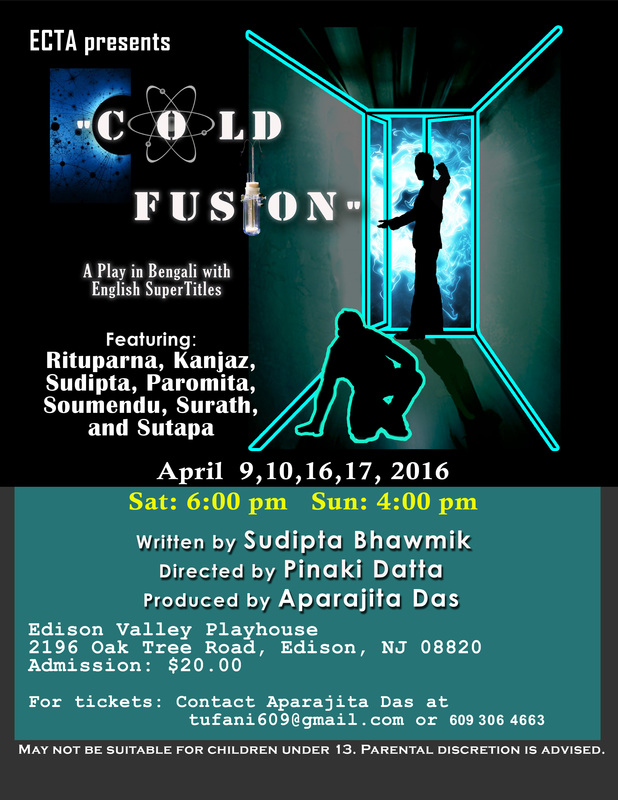 Cold fusion is a play about hope, about dreams and most of all, about love. When we experience something different, something that defies our conventional wisdom, something that challenges our deep-rooted beliefs, we feel shocked. We feel horrified. We go into denial and stop being normal compassionate human beings. We fight tooth and nail to defend the status quo. In the process, we often hurt those whom we love the most. I would like to thank Pinaki Datta for taking up the challenge to direct the play, and thanks to the cast and crew of the production for giving my words a life on stage. 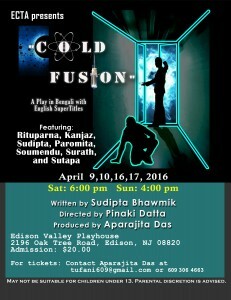 I hope those who come to watch the play would enjoy the performance and be intrigued by the story of Cold Fusion. Duryodhan’s attempt to humiliate the Pandavas went haywire. He got into a fight with the Gandharavas and was defeated and captured. The Pandava brothers fought the Gandharvas to rescue Duryodhan and his entourage. 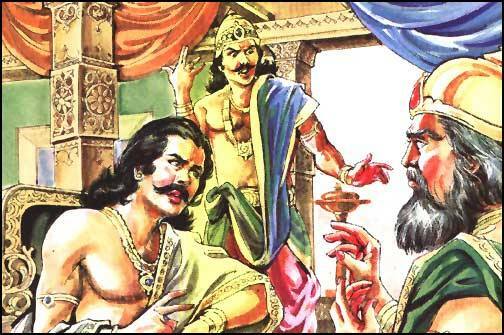 However, instead of being grateful, Duryodhan felt humiliated and belittled by the Pandavas. Suffering from extreme grief, Duryodhan decides to fast unto death. His friends try to dissuade him from being so harsh on himself, but he is adamant. But Duryodhan recovers from his depression and returns to Hastinapur. Karna renews his vow to destroy Pandavas. Listen to this exciting episode by clicking the player below, or subscribe to the podcast in iTunes.